As the Honolulu plumbing experts, Emergency Plumbing & Solar knows a thing or two about quality bathrooms. It takes a combination of sturdy plumbing solutions, budget management, and design vision to create a great bathroom from scratch. In this blog, our bathroom remodel team will give you a few design tips for an amazing bathroom. With the right strategies, you’ll end up with a practical and beautiful bathroom that you’ll love for a long time! Consider swapping a tub for a shower. It’s always nice to lay down in a comfortable bathtub—but how often does that really happen? Most tubs are too short and too shallow—and with most bathroom spaces limiting the area in which you can place a bathtub, and a shower might be a more luxurious, spacious, and affordable option. The average fiberglass tub (which is nothing to get excited about) will cost you anywhere from $400-$800, and it will take up plenty of physical and visual space with very little visual appeal. A beautiful tiled shower will cost land in a similar price range (with door and shower head included, and you’ll give your bathroom an immediate boost in luxury and functionality. Plus, your shower will be incredibly spacious to boot! To turn up the luxury even further in your shower, opt for a rainfall showerhead and some high-end shower knobs to complete the look. Your bathroom will look more like a spa when it’s all said and done! Splurge on a few high-end touches. A bathroom full of luxurious appliances and fixtures looks great—if you can afford it. Most of us don’t have the budget for high-end everything in our bathrooms, but that doesn’t mean we can’t achieve a high-end bathroom look. The key is to pick a few fancy items with a lot of visual appeal that will take the forefront in your bathroom—lighting fixtures, cabinets, countertops, or flooring, for example—that will make give it some luxurious flair. Then, you can fill out your bathroom with some cheaper, less noticeable pieces (like tiles and mirrors) for a bathroom that looks more expensive than it actually is. You could have the most beautiful bathroom on the planet—but if it’s not well-lit, some of that beauty might be lost. When it comes to bathroom renovations, it’s important to keep three varieties of lighting in mind: overhead lighting, which will fill your space with light; task lighting, which lights specific areas of your bathroom for adding productivity, like shower lights and mirror lights for doing makeup or brushing teeth; and mood lighting so you can turn down and relax in your luxurious bathroom space. Lighting is a great place to save money in your bathroom. With so many light fixtures at discount bathroom stores and flea markets, you can find one-of-a-kind lighting pieces for a fraction of the cost of bathroom design stores. Buy a toilet with some oomph. If you’re looking for places to save money in your new bathroom, it shouldn’t be with your toilet. A cheap toilet is like a cheap mattress—it’ll work just fine for awhile. But soon enough, it’ll start breaking down and picking up weird stains and you’ll wish you would’ve spent more money on a nicer model at the start. Approach buying a toilet like buying a car or a refrigerator—check sites like Consumer Reports to see which toilets have the best flushing power, durability, and water efficiency, and pick the highest-performing one that best fits your budget. If there’s one thing we know as plumbers, it’s that a cheap toilet only leads to costly repairs and convoluted plumbing problems. Pick a good toilet, and it’ll be sturdy and steady for years to come. 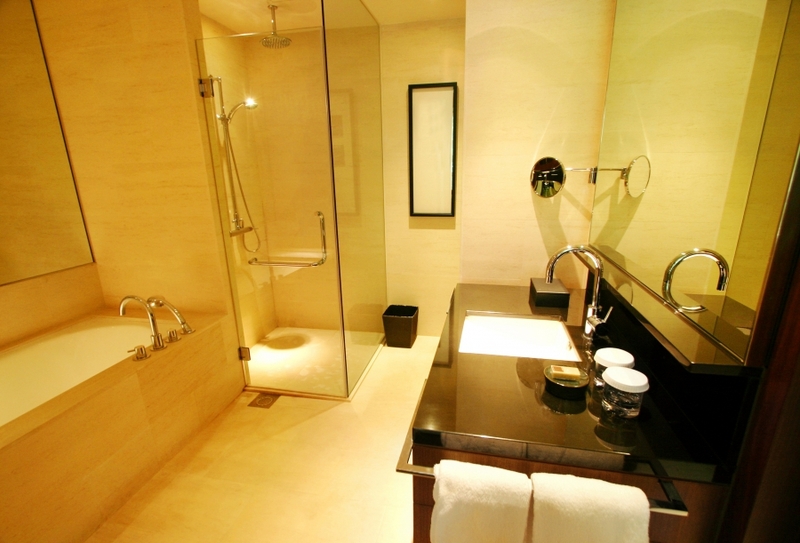 If you’re like most of us, you want your bathroom to feel as luxurious and spa-like as possible. However, if your toilet is the first thing you see when you walk in the door, it could definitely ruin the mood. Hiding your toilet behind the vanity and away from the door is the most common way to hide your toilet from plain view, and many custom master bathrooms use shelving or faux walls to hide the toilet and provide the toilet user with some added privacy. Hiding your toilet doesn’t just increase the feeling of luxury—you’ll be happy your toilet is tucked away when a guest barges in on you during a dinner party. If there’s one thing that scares plumbers, it’s a bathroom with no windows. Bathrooms without ventilation from the natural world can harbor a lot of strange smells, and they’re much more likely to grow mold and mildew that can cause health problems. Plus, natural light makes any room more comfortable—without it, your bathroom could could less like a spa and more like a dungeon. Skylights are perfect for someone who doesn’t have the option to add windows (or doesn’t want windows at all) because you still get the natural light that can save your money and make your bathroom more visually appealing. Skylights are no more expensive than a typical window installation, and they’re visually interesting in a way that even windows can’t compete with. You might even get some views of the stars when you’re soaking your brand new bathtub. Behind every great bathroom, there is an experienced team of plumbers. That’s where Emergency Plumbing & Solar can help. With decades of experience serving Honolulu and the entire island of Oahu, we’re happy to help you build a bathroom you’ll love for as long as you own your home. Get started with EPS today! Bathroom Design Tips Overall rating: 5 out of 5 based on 10 reviews.